In the latter part of 2015, an OIC for Finance, Ma. Concepcion Lupisan, from Miriam College filed a libel case against Rebecca T. Añonuevo. The libel case is based on the letter Rebecca wrote to the members of the Board of Trustees of Miriam College. In the letter, the complainant was named and, as she alleged in her complaint-affidavit, was maligned by Rebecca. The letter to the BOT was Rebecca’s last resort at airing their grievance against Miriam College administrators who are about to terminate them (the General Faculty) come June 2016 as a result of the implementation of the K to 12 law. Rebecca is the author of 6 collections of poetry, two (nos 3 and 6) of which won the National Book Awards: (1) Bago ang Babae, (2) Pananahan, (3) Nakatanim na Granada ang Diyos, (4) Saulado, (5) Kalahati at Umpisa, at (6) Isa Lang ang Pangalan. She wrote two books on criticism, the first one her Phd dissertation, Talinghaga ng Gana: Ang Banal sa mga Piling Tulang Tagalog ng Ika-20 Siglo, and Talab. Both won the National Book Awards. She is also the author of Ang Mahiyaing Manok, which is consistently one of the 25 bestselling titles of Adarna House. In 2010, she received the Gawad Balagtas from the Komisyon sa Wikang Filipino for her contribution in writing, literature, and teaching Filipino; and in 2013, she received the SEAWrite awards given by the Thai Royalty in recognition of the SEA writers’ significant contribution in the field of literature. Some of Rebecca’s trophies: National Book Award for Isa Lang ang Pangalan (2013), the circular glass is the Galing ng Maybungueño Award (2016) from Brgy. Maybunga where she resides, for making her barangay proud for being an expert in her field of literature, the blue one at the back of the glass plaque is the National Book Award (2015) trophy for her book Talab, and the brown one on the right most is her St. Antoninus of Florence Award (2014) from UST in recognition of her consummate professionalism as an alumna of the UST Graduate School. She is a professor of literature and writing in Miriam College where she had served as chair of both the Department of English and the Department of Filipino. Last but not the least, she is married to me. She is the president of the College Faculty Association of Miriam College and she leads the protest against the action of Miriam College’s administrators who insist on separating the 20+ General Education faculty members (she included) as a result of the implementation of the K to 12 law. As the CFA president, she wrote 11 letters to the administrators to no avail. She wrote the Board of Trustees as a last resort to bring to their attention the grievances about certain about certain administrators. Now, this letter of hers to the BOT is the basis of the complaint for libel filed by Ms. Lupisan. On December 2, 2015, when Rebecca received the subpoena from the prosecutor’s office, she immediately posted it on Facebook. The subpoena states that the libel case was filed by Miriam College and Ma. Concepcion Lupisan. It was shared 21 times, received 165 likes and 98 comments of support. On December 2, 2015, after receiving the subpoena from the QC Prosecutor’s Office, Rebecca posted the same on her FB wall. January 7, 2016 was the first time we were meeting the complainant in the prosecutor’s office. The complainant was accompanied by three lawyers. While Rebecca was accompanied by our writer friend John Iremil Teodoro, myself, and my boss and mentor, Atty. Leonides Respicio who had to leave early. After about two hours and 17 cases heard before ours, our case was finally called. When we entered the prosecutor’s office, the complainant clarified that the libel case she filed against Rebecca was her personal case, and Miriam College had nothing to do with it. Perhaps to correct the fact that Miriam is not involved in anyway, complainant’s lawyer wrote the City Prosecutor’s Office. And the City Prosecutor must have requested for the records that’s why the case folder was not in the prosecutor’s office, and had to be fetched from the records section, which explains why we were called last. The prosecutor asked the parties to consider settling the case, since Ms. Lupisan and Rebecca had known each other for 15 years already. She also asked for the background from where the case arose. Both the complainant and Rebecca were asked to speak. The hearing was done around 12 noon. 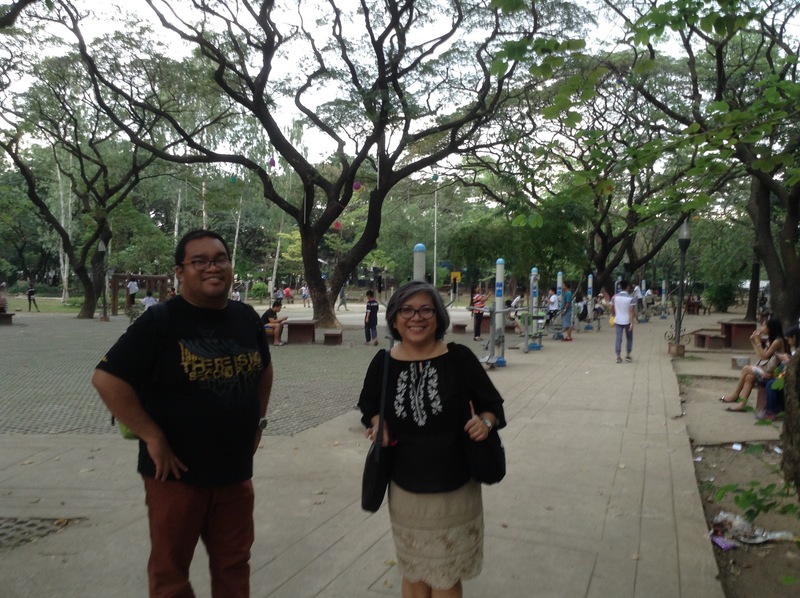 We decided to have our lunch inside the Quezon City Memorial Circle. Rebecca’s FB post on our lunch after the first hearing: John Iremil, ako, and Rebecca. 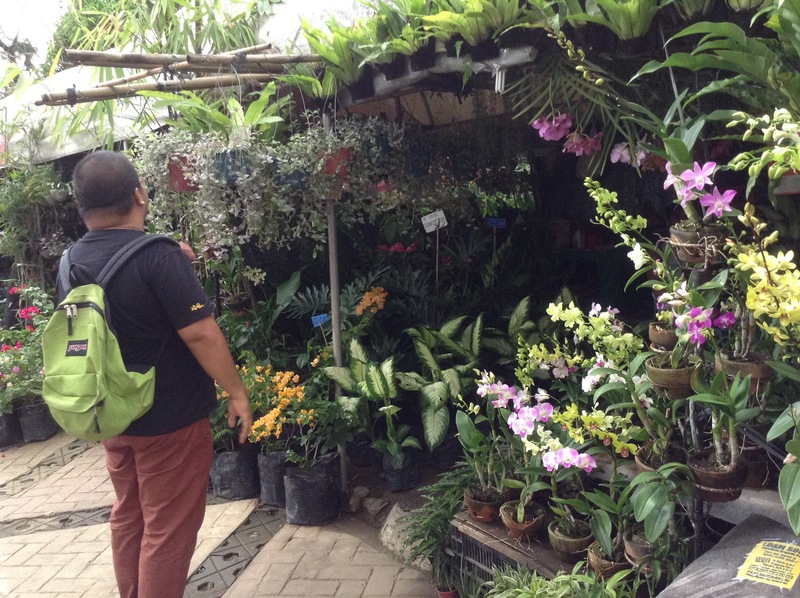 After lunch, John wanted to buy some plants. 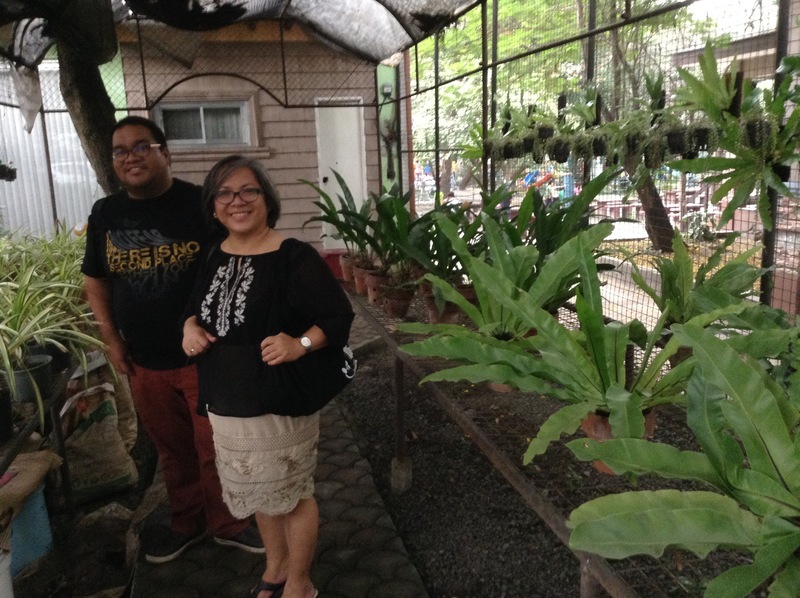 We looked for the plants, but ended up in the house of Manuel L. Quezon. It was open so we went in. We were introduced to John Paul Castanares. He said he comes from the Office of the Vice-Mayor and he would serve as our tour guide. Ako, si JE Teodoro, Rebecca, and John Paul Castañares, our tour guide. We were toured in the replica of the house that once stood in New Manila. 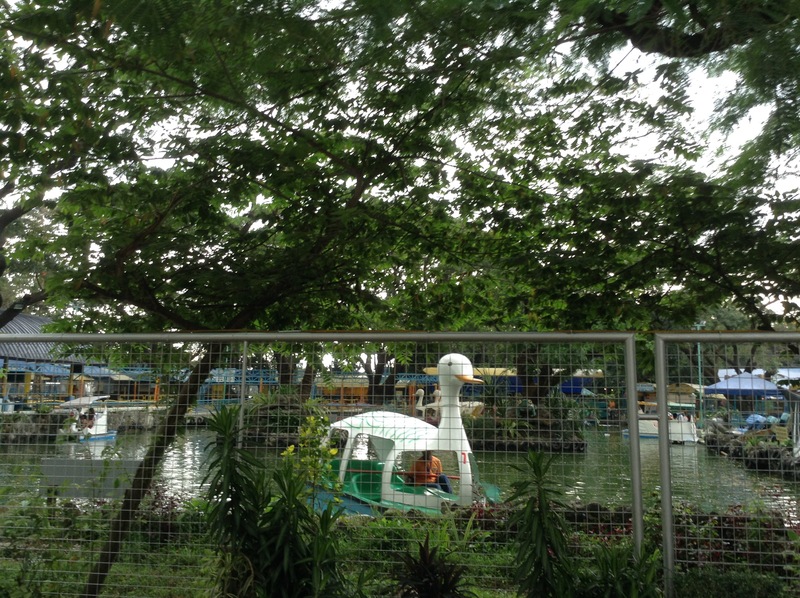 President Quezon used it as his week-end house after he was diagnosed with tuberculosis. The second floor had three rooms, one for the President, the second for his nurse, and the third room for his wife. Now the house has 60% of the original material preserved. 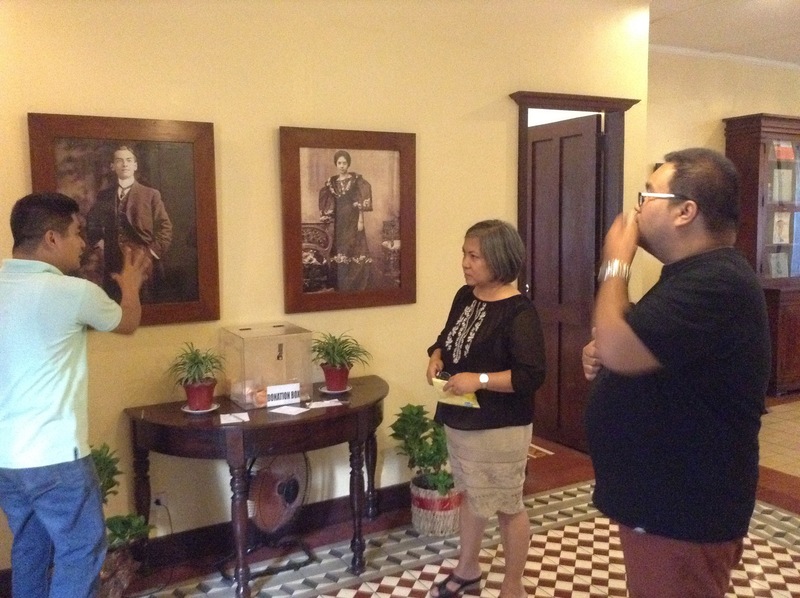 JP Castañares shows us the controverial photo of Pres Quezon. He was critized for planting in puddies in boots and polo shirt. May relo pa! The winding steel staircase leading to the ground floor. Tour guide JP explains Pres Quezon’s favorite game with his children. Rebecca and John in their favorite furniture in the President’s house. John and Rebecca’s dream conference room where Doña Aurora met the Red Cross representatives. A corner of the house led to the winding steel stairs that brought us to the ground floor of the house. There were two or three more rooms on the ground floor, a reception area, and a conference room where President Quezon’s wife, Aurora, had her first meeting with the Red Cross representatives. She became the country’s first chairperson of the Red Cross. After the tour, we went towards the direction pointed to us by the guard. He said, we can buy plants over there. We crossed a park, lined with exercise equipment. We also passed by a series of restaurants. 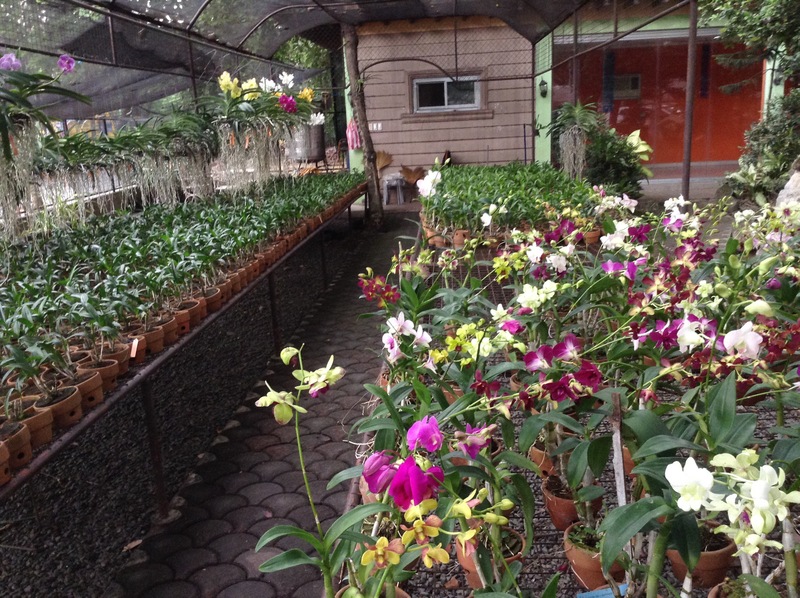 Finally, we found a place full of orchids and ornamental plants. Although the gate was open, no one seemed to be inside. After checking the orchids and the plants, we continued our walk to find plants that pleased John. 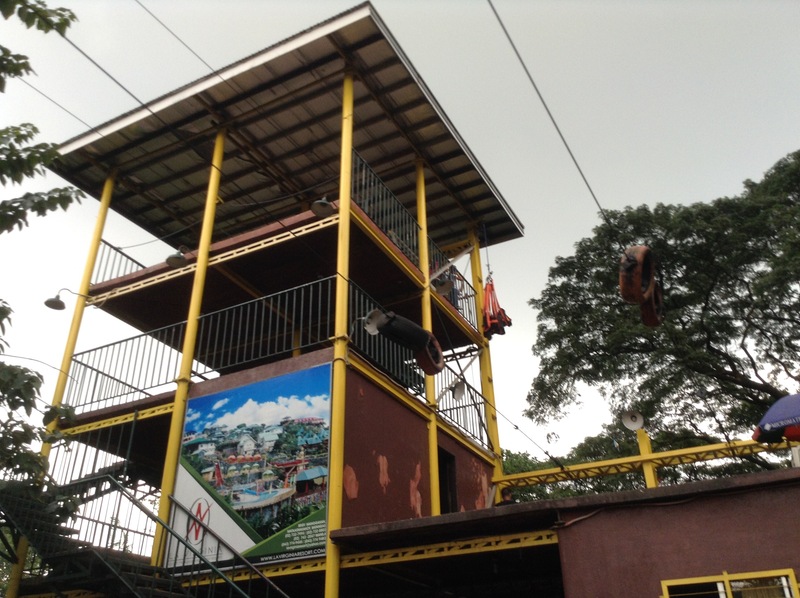 We passed by the amusement park, a lagoon, and a zipline. Finally, we found the line of stores selling plants. John bought an orchid and a hanging plant. Then we hurried back to the car because it started to rain. Rebecca’s next hearing is on February 4, 2016. We will file her counter-affidavit on that date. John said, after the February 4, 2016 hearing, we will return to the QC Circle again to buy more plants. This entry was tagged JE Teodoro, John Iremil Teodoro, John Paul Castañares, Libel, Ma. Concepcion Lupisan, Quezon City Circle, Quezon Heritage House, Rebecca Anonuevo. Bookmark the permalink.